Several years ago, Prime Minister Tuilaepa Sa’ilele Malielegaoi’s Government ordered residents of Sogi to relocate. With the offer of a quarter acre land at Falelauniu they could lease to own for $30,000 and $3,000 relocation cost, residents were given a few years to make the move. At first many of them opposed the decision. But as time wore on, some residents decided to accept the offer, packed up and headed inland to what they now call home. Others though refused to move at all. How can we forget elderly mother, Tala Lei’ataua, who issued a heartfelt plea to Prime Minister Tuilaepa at the time? Folks, you don’t hear a plea as such, especially from an elderly grandmother who has known no other home apart from Sogi, and not be affected by it. Still, the Government would not budge. So some time in 2016, the Government through the Samoa Land Corporation (S.L.C.) had had enough and threatened to evict all Sogi residents. Out of fear, they obliged and moved except for one family. Nanai Liutofagaomataafa Tokuma took the fight a step further. 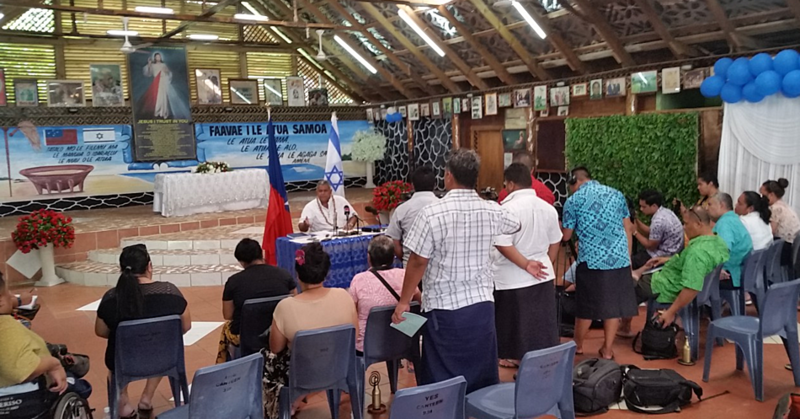 As descendants of Turore Tokuma, Nanai filed a lawsuit against the Government, arguing that they have every right to be on that land and that the Government could not evict them. The family claimed that the land they were living on was a gift to Turore Tokuma, his wife and their four children by then Commissioner of Crown Estates of Samoa and also the Public Trustee, Percival Ernest Patrick. It followed his father’s wrongful and his near death sentence for the alleged killing of a Chinese businessman. He claimed that when it was brought to light it wasn’t his father who killed the Chinese businessman; the Government at the time offered them the land as compensation. • An order for interim injunction to stop them from being evicted. Last week, the Supreme Court, through Justice Lei’ataualesa Daryl Clarke, delivered its decision. In short, he ruled that Nanai’s family have failed to provide evidence to prove their claims. He was firm that most of the evidence provided by the family was hearsay. “There was however no evidence to establish the existence of a gift of the Sogi land to the Plaintiffs or their ancestors; a breach of a proper purpose; a breach of legitimate expectation; or the existence or breach of any contract,” Justice Lei’ataualesa ruled. “For the reasons that follow, the Plaintiffs who bear the onus of proving their case on the balance of probabilities have failed to do so and by some way.” The full ruling has been published over several editions of the Samoa Observer as well as our online version. Legally, it’s hard to argue against Justice Leiataualesa’s ruling. He has to make a decision based on evidence that is available before him and unfortunately hearsay cannot be taken as fact. We can understand that. But say for argument sake that we are to take this ruling and apply it our history, genealogies and life of Samoans in general, where does that leave us with the stories passed down from generation to generation? That is one of the questions this decision raises, which is especially relevant given our history of stories, genealogy and tales being passed down by word of mouth. Keep in mind that back in those days, it was a luxury to have a pencil let alone a piece of paper. That said, Nanai and his family would obviously be devastated by the decision. In the build up, they had insisted they would not move. Elderly mother Tala Lei’ataua is part of the family. The Court has clearly spoken and that they have lost the fight. What are they going to do now? The inevitable is that they will have to relocate or face being convicted for contempt of Court. But what if they absolutely refuse to move?